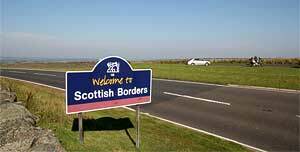 The official England-Scotland border was established in 1237 by the Treaty of York, between England and Scotland. The border runs for 154 km from Lamberton, north of Berwick-upon-Tweed in the east, to Gretna near the Solway Firth in the west. The map shows that the River Tweed for a part forms a natural border between Coldstream and Berwick but just before the border reaches Berwick it leaves the river and runs north around the town of Berwick. The reason is that in 1482 the town was captured by Richard Duke of Gloucester, the future King Richard III, although not officially merged into England. England has administered the town since this date. 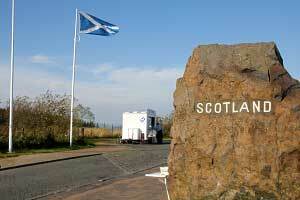 Following the Treaty of Union 1707 which united Scotland and England to form the Kingdom of Great Britain, the Border continues to form the boundary of two distinct legal jurisdictions as the treaty between the two countries guaranteed the continued separation of English law and Scots law. Apart from many walking tracks and secondary roads there are a few major roads where you are likely to cross the England-Scotland border by car. From East to West they are: The A1 north of Berwick, the A6105 a few miles to the west, the A697 at Coldstream, the A68 at Carter Bar, the A7 north of Longtown and the biggest one, the M6 at Gretna. From the roads mentioned here I believe the A68 from Corbridge/Hexham to Jedburgh is the most interesting one from a landscape point of view. 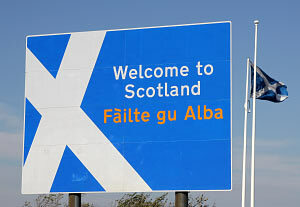 What they all have in common is the big blue welcoming sign saying “Welcome to Scotland” and in Gaelic “Failte gu Alba”. 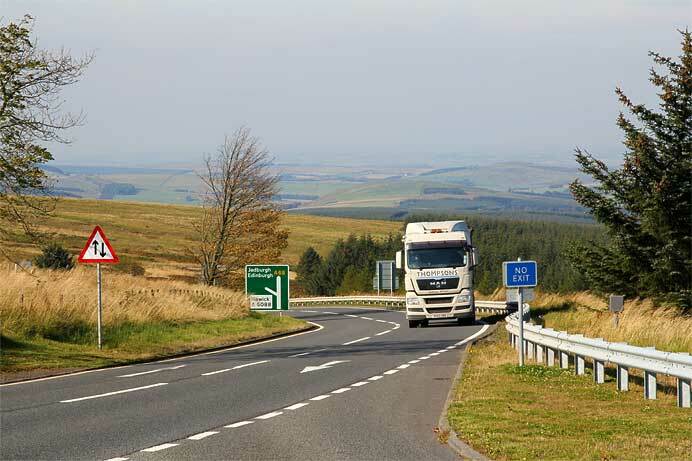 The most beautiful scenic border crossing to enter Scotland is the one on the A68 at the Carter Bar in the Cheviot Hills which are part of the Scottish Borders. 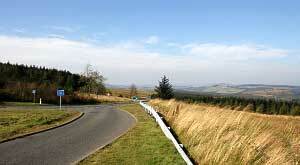 Carter Bar is the pass where the A68 crosses the England-Scotland border at an altitude of 418 metres. The views north towards the Scottish Borders are fabulous but it can be quite windy here as well because of the altitude. An Interesting detail is that in 1575 Carter Bar was the scene of the Raid of the Redeswire, one of the last large-scale battles between the English and the Scots. Nowadays Carter Bar forms a popular point for tourists to stop and take photographs on the England-Scotland border. There are two marker stones on either side of the A68 for this purpose. You can usually hear the bagpipes on both sides of the border from a wee cd player and you can also buy a CD from the “Border Piper” who welcomed people in earlier times, although I believe there were several pipers welcoming tourists and collecting money in the process. The Carter Bar, once known as “Red Swire”, has a long and eventful history. Roman legions invaded after 79 AD, building “Dere Street” which passes 5 miles to the east. They subdued native British tribes in various campaigns, before pulling back their frontier to Hadrian’s Wall. Years later, ancient poetry recalls the southward march over these hills of King Mynyddog’s warband from the Gododdin tribe. These Celtic warriors fell in heroic destruction by a great army of invading Saxons at Catterick. Tribal boundaries switched regularly for centuries until the Gaelic (Scots) army of King Malcolm III decisively beat the Anglo-Saxons (English) at Carham-on-Tweed in 1018. The Border then assumed more or less its present position, confirmed by the Treaty of York 1237. The death of Alexander III, King of Scots, in 1286 led to three centuries of savage Scottish-English conflict, with frequent wars and invasions, continuous raiding and general anarchy in the Borderlands. A Scots army passed Carter Bar in 1388 to the great battle of Otterburn. This was the era of the Border Reivers, or “moss-troopers”, lawless families raiding back and forth with scant regard to lives, property or even kings, who placed the frontier under the ineffective control of the “Wardens of the Middle March”. 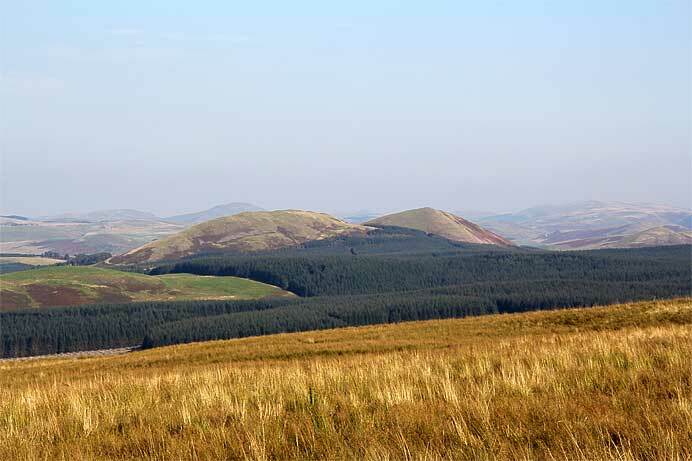 A meeting of the Scottish and English Wardens in 1575 occasioned the last fatal Border skirmish, The Redeswire Fray, on the slopes to the east of Carter Bar. The Unions of 1603 and 1707 finally brought an end to military conflict between the two countries.